What! Boy did this tick me off. Made me want to pull my hair out and look like I did before my hair drug medicine (see actual photo of me). Also it is hard to find a good stager/redesigner. Some even lie! And you know I’ll call them out on it. See: Stager Caught Lying About “17 day avg” Results! Whenever I jump into an abyss (non DC area) to help a college friend, or a relative find a Realtor… I first find a great stager (I use ActiveRain). I ask the stager “Who uses you frequently and always uses super wide angle photos?” Man of man this eliminates 97-99% of the Realtors and leaves me with some great options. I’m sorry, while it won’t guarantee anything, if I find a Realtor that requires all of their listings be staged, I am 99% confident they will not be a Sucky Listing Agent. Ask Dave and Bill, they were thrill when their houses sold in a down market for over what they were expecting. 5) Another Realtor wanted to hurry and list the property in 48 hours. right, and doing it right, nets the seller MORE! 6) Another hesitation from my brother: “But I want the Realtor that sells everything in the neighborhood.” While there can be some benefits, I know some VERY sucky agents that do a crapload of business. Here is their secret… They spend $100,000 (yes 5 zeros) sending out postcards endlessly. The postcards look like they are trying to sell somebody’s home. But the inside scoop (which you only get on this blog, so make sure to sign up) is they are NOT marketing the home at all (postcards don’t sell homes, especially “sold cards”). They are MARKETING THEMSELVES NOT THE PROPERTY! They spend a boat load of $ to get you to call them. That in NO WAY correlates with them being any good at getting you the highest net. Why don’t I get into that business? If the $100k pays for itself, why not? Because it disgusts me. I’ll just blog and save a forest. I love flipping through those 4-color magazines in grocery stores. With full page ads “selling” homes. That does NOT sell homes, that sells the Realtor and lets them say “look I will put you in this glossy magazine” that no buyers look at. They instead use the interweb. 7) Don’t fall for the guy that uses in his pitch “Google XYZ area and look, I’m #1.” Like above, that just means they know how to do Search Engine Optimization by hiring a firm in India to write mini articles to get their ranking up. Search engines do NOT sell your home, but it might get you to contact that Realtor. Sure sounds powerful doesn’t it? If he can market himself, he can market my home. Yes logical. But no, it is not correlated. 9) Not all Real Estate bloggers are good Realtors. (and vice versa). Ha, this is worthy of another full post. I had a prospective buyer (from my blog) call me and say he was hesitant because he used a New York Realtor that was a well-read blogger, but they ultimately didn’t think he was any good. On the flip side, I had a buyer that wanted a recommendation for a Realtor in another town. I gave her a great Realtor’s name. But the seller didn’t want to use that Realtor… because she didn’t have a blog. Too funny. I have been bugging her to start one, but she says she isn’t a witty writer. Also she gets tons of referral from satisfied prior clients and is happy with her deal flow. Kudos to her! Sign up for more progress reports on my brother’s listing. Great post Frank. Thanks – I hope a lot of people read this. When someone you know is trying to choose a good REALTOR, it really does bring home what consumers are going through. Each time one of my children went looking for an agent, I ended up tweaking my marketing or presentations. Just look… it gave you tons of inspiration for this excellent post! When my friends need help outside of my area, I go to CRS site and go by the area, where I need help. Then I look at the list, and then compare paying attention to education (they have tons of continuing courses), whether they are on AR and whether I like what they write. But the first test is the photo. If on CRS site the list of 20 and there are 3 photos, I already narrowed to 3 agents. I think it eliminated a lot of troubles that you are trying to avoid, and so far worked very well each time. The funny part is that I do not have CRS myself. Jon, You nailed it. You don’t have a “CRS,” and either do I. I know many bad agents that dedicate their life to having as many symbols after their name as possible. And the 3 photos… that doesn’t mean they are better, it just means they thought about registering on the site, or have nothing better to do because they have no business. Well Frank, you’ve touched a nerve in me today. I just lost a job to a staging Realtor. I was asked to submit a bid on a vacant flip house because I was highly recommended by another Realtor. The flipper told me up front that he had used this staging Realtor in the past, but thought it smart to get a second opinion. He told me that while I would be more reasonably-priced and knew I would do a great job, he felt a loyalty to this staging Realtor and was going to hire her (as the stager, NOT the listing agent, by the way). OK. I respect that. I just pulled up the photos on MLS. The staging is adequate, but far from fabulous. So, while I understand a listing agent staging their own listing as part of their marketing/commission, I question having a side business staging for other sellers. Marianne…you just touched a nerve in me. I just lost a listing job to an agent who didn’t want to stage (I have clients do a full staging). The seller told me he preferred the other agents strategy of pricing the house very low, in it’s present condition, and letting the market bid the house up. Frank…I appreciate the post. I’d love to see some empirical evidence of how much higher staged houses sell in comparison to the amount spent on staging them. I’m guessing not enough sellers stage to get a good pool of data for that study though. Frank — your blogs are always refreshing and informative, thank you! I’d also want to select a Realtor who’s honest and forthright about the market (overall and specific to your area). Setting realistic expectations is important, and comparables from a year ago — even 6 months ago — aren’t relevant today. Artificial optimism and spin make me very suspicious. Does the Realtor work with a particular (or more than one) stager? Can you see examples of their work? Are the examples appropriate to the architecture of the home and its target market? I concur with everything Michelle mentions above — excellent comments. By the way I just moved from Austin a few months ago. If your brother is looking for a Realtor in Austin I might have some suggestions. As always, enjoyed your blog. This one was especially good and I loved the wheel cam video too. When we ever do shake enough quarters out of the couch for a down payment, you’re our man. The only thing: check your spelling on “moral”. ;) Also, will you ever do another post on the rent vs. buy calculation again, given the “new economy”? Yeah, I hate those agents with all those symbols after their names too. Is your bro near Georgetown? Does baking brownies = staging? Great post – I always enjoy the “wheel-estate cam” videos! You are right on the money once again… I’ll admit, I’m a 1st time home buyer with -no vision-! I see the newly remodeled homes, “granite” counter tops, wood floors, kitchens, etc… and get SUCKED right in to want to pay more! I honestly don’t know how much the remodeling costs… I just think it’s $$$$ so perhaps it’s better to pay up front and appreciate it. That’s a better $$ deal for the seller though, not me. PS- Really enjoyed the “coupon book” tips and humor! Deals, deals, deals! How unfortunate that some (or perhaps most . . . you did say a “crapload” of business) consumers equate postcards and glossy magazine ads with competency and/or the right agent for them. In your experience what kind of references are these agents able to offer prospects (assuming they get asked for any)? You are right once again… I’ll admit, I’m a 1st time home buyer with -no vision-! I see the newly remodeled homes, “granite” counter tops, wood floors, kitchens, etc… and get SUCKED right in to want to pay more! I honestly don’t know how much the remodeling costs… I just think it’s $$$$ so perhaps it’s better to pay up front and appreciate it. That’s a better $$ deal for the seller though, not me. As a stager and wife of a realtor, I loved, loved, loved this blog! 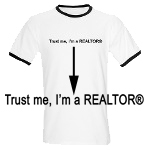 Great humor and great advice as to how to select a realtor. When my husband and I tried to sell an out of state property, we made the HUGE mistake of choosing a “combo’er” realtor/stager. This combo’er definately did not know how to access the design part of the brain. The realtors “staging” efforts resulted in severely compromising the seller/realtor relationship because we were so unhappy with the service. I had to get on a plane and go undo the damage so that we could get the house sold. Well – I want to join the long line of stagers reacting to your post. Selling a home is one distinct skill and staging / decorating a home is an entirely different skill set. I don’t pretend to be able to sell a house and I don’t know any realtors that are qualified to stage. Leave it to the professionals!